Photo of students in the Decloux room, 1920. Photo courtesy of the Cooper Hewitt, Smithsonian Design Museum. In the late 1800s, American museums largely ignored the decorative arts, easing any competition the sisters faced during their European collecting trips. They would often supply many objects directly from their family (to their mother’s consternation). Wealthy and influential friends, such as J.P. Morgan, also generously contributed magnificent collections to the new museum. At the same time, the business as well as the pleasure of applied and decorative arts was starting to be treated seriously by influential New Yorkers. 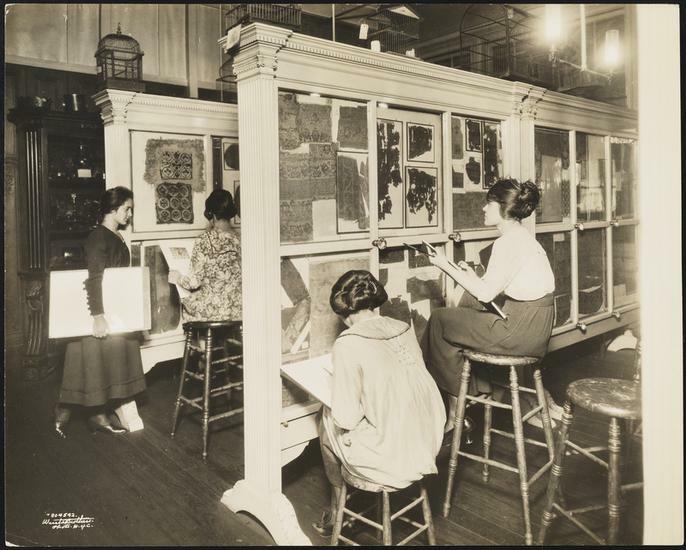 In the 1890s, magazine articles appeared suggesting that women might learn more about the decorative arts and even pursue careers in the field. The Hewitts’ initiative and philosophy matched well with this trend, with many women availing themselves of the museum. Indeed, with no paid staff, many prominent women and Hewitt friends like socialite Alva Vanderbilt, novelist Edith Wharton, and designer Elsie de Wolfe supported the enterprise. Students looking at textiles, ca. 1925. Photo courtesy of the Cooper Hewitt, Smithsonian Design Museum. The sisters would share responsibilities as directors of the museum until Eleanor’s death in 1924. Sarah would continue as director until her passing in 1930. The museum progressed throughout the 20th century, but by the early 1960s the museum and the Cooper Union lost the glue that held them together. In 1963, the Cooper Union announced the closure of the museum. Thankfully, this was not a popular decision to its many fans, and a committee led by Henry Francis Du Pont quickly formed to find a way to save it from its demise. Negotiations began that eventually resulted in the museum joining the Smithsonian Institution’s complex of museums. In 1968, with approval of the New York Supreme Court, the museum officially became a part of the Smithsonian. It would take almost a decade before anyone could see the collections again in person, reopening in its new location in the former mansion of Andrew Carnegie in 1976 as the Cooper-Hewitt Museum of Design. Under the guidance of the Smithsonian, the museum would undergo many more changes, including a few variations on the name and expansion to modern and contemporary design. After extensive renovations, including the move of the library to the nearby Fox mansion, the museum’s latest iteration as the Cooper Hewitt, Smithsonian Design Museum officially became public this past December. 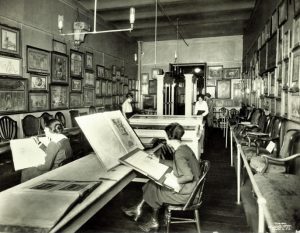 While the cutting-edge features—such as an interactive pen that digitally tracks your visit—would make the museum almost unrecognizable to the Hewitt sisters, they would be pleased by the continuation of their innovative and unique approach to museums. 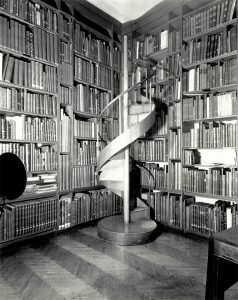 Photo of the Sarah Cooper Hewitt Memorial Library in the Cooper Union Museum, installed in 1932. This library housed the Decloux Collection, the Eleanor Hewitt Textile Reference Library, and Sarah’s private collection of rare art books. Photo courtesy of the Cooper Hewitt, Smithsonian Design Museum.